I have a new book. It's a recipe book of course. And a biography of sorts. 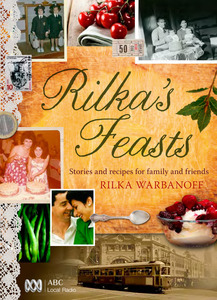 It's called Rilka's Feasts and I am in love with this book, or more the stories in this book. I first came across Rilka Warbanoff when we moved Tom and Hannah to the new school. I had a longer school run and so managed to catch the beginning of Rilka's segment with Lindy Burns on ABC 774 here in Melbourne. I was hooked after the first 5 minutes. It took me a long time to actually hear a complete segment. We usually arrived home about half-way through, and with things to do, people to feed, washing to bring in and newsletters to send I'd jump regretfully out of the car. Occasionally I'd sit and listen to the whole segment, when it was just to0 fascinating to leave. I loved that Rilka talks about her family, her grandmother, her mother, her father, how her family evolved around food. It tugged at my heartstrings because I come from a family of foodies. My mother and my aunties are fabulous cooks and a family get-together was always a feast. And being a large-ish family there is always an excuse for a celebration. Someone is always having a birthday or getting engaged, graduating, having a baby, getting married, moving into a new house, leaving on a trip, arriving home from a trip - you name it we turn it into a celebration. So when Rilka talks about food, inter-woven around her family I get it. And I love it. It's heirloom cooking. Recipes and methods passed down through the generations, from mother to daughter to grand-daughter to great-grandaughter and so on down the family tree. They are the foods of our homelands, family favourites that may not appear in any recipe book on earth. But they exist. They are the treasures that are talked about over lunch, shared before special events and handed over tenderly, as though they are precious. And they are. Many are handwritten in notebooks where the paper is so aged it's yellowed and the ink has bled through, browned on the edges and marked with the slightly greasy fingerprints of the countless cooks who've used them. Or they're scribbled on scraps of paper, the backs of envelopes or torn out of newspapers and magazines. They have notes scrawled on them for the cook to follow. These are the treasures that hold families together. It's said that the way to a man's heart is through his stomach. I think that good food is the bond that holds families close. When you share a good meal with others you can't be angry or hold grudges or sulk. Good food encourages talk and laughter and caring, it puts a smile on faces. It creates fond memories that are thought of and mentioned frequently with the passing years. Yes, heirloom cooking holds families together. When I cook for my family I'm creating a memory. Yes, I'm nourishing them but more importantly I want them to remember the amazing pot roast we had for Uncle Greg's birthday and the delicious trifles that are a New Years lunch tradition. I want them to know with every mouthful that I love them enough to create good food just for them. And that's why I so enjoy Rilka's radio segment and now her book. It's why I have my Mother's Commonsense Cookery Book. It's 54 years old and falling apart, the pages are marked with spills and splotches but I still use it. The measurements talk of ounces and pounds and stones and gills - a gill is a liquid measurement. Isn't it quaint? It makes me want to jump up right now and whip up a Victoria sponge. My childhood is in this cookbook. The winter nights when lemon delicious, with cream and ice-cream, was dished up to all good children who ate all their veggies. Or the lemon sago (frog's eyes anyone?) or the barley water Mum would make for us. Or the drop scones on a Saturday night as we sat in front of the TV and watched "The Best of British Comedy". Heirloom cooking. I have recipes from Wayne's grand-mother. Granny Armstrong wrote them out for me when we went to tell her were engaged. She wrote out all the dishes, cakes, slices and biscuits she made for him. I feel honoured. I had no idea until years after she had passed away but Granny didn't share her recipes. With anyone. Except apparently me. On each sheet of paper she made little notes against the ingredients or the method, little tweaks she'd given them over the years. I value those recipes and guard them. They will be passed on to Hannah when she starts to create her own home. And she will know they are recipes from her great-grandmother that her Dad and her Uncle and Aunty loved as children. Heirloom cooking. My own mother is slowly and painfully writing out her recipes for Hannah and my niece. Painfully because the arthritis in her hands makes writing for any length of time arduous. It's a labour of love and the girls will be privileged to have them. Many of Mum's recipes are of the "take 2 or 3 cups of flour, add a little butter, stir in eggs, add milk to make consistency of cake. Bake in mod oven". No quantities, pan sizes or times. Cooking by instinct, something that comes with practice and experience. These odd recipes are family favourites. Foods my brother and I still request, he cheesecake for his birthday, me caramel tart. Heirloom cooking. This weekend as I use my Great-Grandma's recipe for fig jam and my mother-in-law's recipe for caramel slice I'll remember: heirloom cooking. I'll be making memories and creating family traditions as I prepare food for my family in my kitchen. I love this idea. My mother gave me so many o fher reicpes over the years usually over the phone when i called right as I was ready to start cooking. You are so right they are heirlooms. My mother is going to be scanning my late grandma wood's recipie book to ensure there is no full on family fight over the books. Obviously we all have recipies we want. Mum said when she scans grandma's she will start scanning her recipie books so that we can all have a copy as well. Sorry about the late reply, Cath, but I wondered if it would be easier to have your Mom voice record the recipes. Even simple smartphones have adequate recording capability & the recipes could be emailed or stored safely online or on a CD. Better yet, you'll have the treasured memories of your mother's voice close at hand. If you have a tape recorder & tapes they'll do although it might be a hassle converting them to mp3 for easy sharing with family & friends as well as transcription. My $40 Huawei mobile from Coles even transcribes the voice recording fairly accurately. I haven't typed a text message in months! Wow, I just got a shiver thinking that YOUR children's grandchildren would be able to hear YOUR mother's voice. I love technology! Talk about handing down recipes - I taught our two sons to cook (wash clothes, iron and mend (sewing on buttons etc) from a very early age - well not everyone is guaranteed to find someone who will do all these things for you - especially these days when most girls don't know (or want to) how to cook. So Son No 2 started a job in hospitality - he had to take over the chef's post when the chef and the boss had a "to-do" and son rang to ask how to cook lambs' fry (actually calf's liver which is much nicer in taste). I explained it all in detail. way of cooking (great lumps) of lambs'fry with bacon in gravy used to just sit there and be thrown away at the end of the lunch period. as this recipe was much more economic, quicker to cook and definitely a very good earner. And yet - it was " an old family European favourite". And it is delicious and healthy. A few years ago my mother decided she needed to re-do her personal recipe book, so two of us gave her new notebooks for her birthday (two was unexpected, but she made a sweets book and a mains book), and she started a big job making that collection of recipes nice. Some of the recipes got re-written into the books, but anything that had been given to her as a written sheet got pasted in. She wrote where every recipe had come from, and one of the books has a section in the back about each of those people. She said at the time that she intended the book to be someone one of us would inherit (and I hope we don't fight over it! ).